The play was first performed in Brisbane in 1995, amidst heated political debates concerning reconciliation, racial discrimination and the conditions that Indigenous Australians were living under as a result of the way they had been dealt with by society and by the Australian government in the past. The discussion of Indigenous history may raise strong feelings and emotions due to the upsetting nature of many of the events that have occurred in the past. See the timeline, Indigenous history post colonisation (PDF, 199KB). In December 1992, Paul Keating’s famous ‘Redfern Speech’ summarised and addressed many of the past injustices committed against the Indigenous people of Australia. The speech is available on YouTube (with closed captions and connected to the National Archives of Australia). An interesting article by Tom Clark ‘Paul Keating’s Redfern speech and its rhetorical legacy’ can also be readily accessed. Whilst this article is quite a complex and sophisticated one, teachers may wish to choose short excerpts to explore with their students. The most interesting aspect of the article is the manner in which it looks at the tension between the speech writer and the politician delivering the speech as a performance. This raises questions about authorship and purpose that will be of interest to students. Researching accounts of Aboriginal contact with Europeans offered some insight into how strange one must have looked to the other; the unbelievable scale of ships, the sheer enigma of European clothes, possessions, language, social hierarchy and behaviour. Perform a mime in groups of four about the effects of this invasion. As an audience, critique each group’s performance in terms of its link to the arrival of white settlers in Australia. Which performance best shows links to our history? What are the effects of the invasion upon the oppressors and the victims? What is lost and why? After reading The Rabbits and researching the history of Indigenous Australians after 1788, you may wish to ask your students to compose their own short narratives using metaphors to explore the effects of colonisation. Students may choose to compose a short piece of writing which either provides an overview of the effects of colonisation or chooses to focus on a specific event. These narratives should be aimed at a child audience and use simple language and short sentences. They should have a didactic purpose (that is, they should try and teach their audience about the wrongs which have been done to their characters with the aim of creating empathy for the victims and enabling the responder to understand their predicament). They should be between 150–250 words long and must include at least some non-human characters. The purpose of the exercise is to explore historical events in a symbolic or metaphorical manner. How did Deborah Mailman meet Wesley Enoch and what is their relationship like? What event originally inspired Enoch to write the play? What does the writer state is the intention of the play? How has Mailman’s attitude towards her Indigenous background changed? What does Mailman like and dislike about acting? Why does Mailman say that the play is not purely autobiographical? On p.9, why does Neville Bonner refer to Moses? What point is he attempting to make about Indigenous history? What does Bonner wish to celebrate about Indigenous culture (p. 11)? What is the message presented in Cec Fisher’s poem (p. 9)? What is the purpose in quoting from this text? Why does Wesley Enoch criticise the “romantic picture” (p. 13) that many White Australians have of Indigenous culture? Read ‘A Cultural History of Australia’ (pp. 22-25) and note down three things you find interesting or surprising about this list of historical events. What did you learn from reading the timeline? For other activities on different related texts see the attached Pre-reading activities document (PDF, 142KB). The play is divided into 24 scenes. Each scene can be seen to relate to either the 7 phases of Aboriginal history or the 5 stages of dying (PDF, 108KB) that appear on the back cover. Some scenes are silent depending on visual effects, some scenes are in an Aboriginal tongue to show connection to the past, while other scenes have very modern dramatic forms such as stand-up comedy. There is some sense of a chronological development through the scenes. The attached plot outline (PDF, 180KB) tracks each of the 24 scenes, their action and purpose. While reading through the play, try to identify the phases and stages in relation to the scenes you read. After you have finished the play, write a paragraph of about ten lines where you provide a plot summary, referring to either the phases or stages in your account of the plot. After composing their stories, students should share them with the class. The 7 Stages of Grieving uses many different genres to convey the Indigenous story, but pre-eminently it is all about telling story. We cry together, we laugh together, and we tell our stories. The inclusive voice in this statement positions the play as a way for its audience to feel a sense of connection to their community, and to empathise with the plight of the central character. 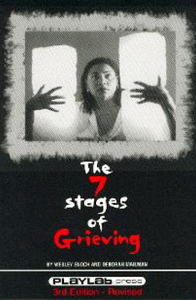 The 7 Stages of Grieving has great significance as a text which presents an Indigenous perspective on the importance of family and on experiences of discrimination in Australian society. Additionally, the play uses storytelling to communicate a political message about the need for reconciliation at a time in our history before the Apology to Australia’s Indigenous peoples. For Murri audiences, a sense of celebration emerges from the grieving. There is a lightening of the load, an elation that comes from hearing stories that need to be told. Reportage allows the actor to use a factual and unemotive tone (particularly in Scene 14, to convey facts surrounding the death of a young Indigenous man in 1993 after police involvement). In his introduction to the playtext, Wesley Enoch describes the play as ‘faction’ – a mixture of fact and fiction. The play therefore links the personal and the political by intertwining the lived experiences of individual Indigenous Australians with historical facts and recollections of contemporary events. The play consists of a number of short scenes acted out by a single actor who portrays an individual’s perspective on historical events and thus uses two-dimensional characterisation: that is, a character who is both an individual and who also represents ‘everyone’ who shares her experiences. The focus on an individual person makes her stories more compelling.There are links to the Indigenous tradition of oral storytelling.The single actor can use the staging/lighting of the play powerfully to ensure a focus on her own perspective within the stories she tells.The protagonist can become a symbolic representation of an ‘everywoman’ and her experiences can be representative of others. Maintaining the energy on stage can be challenging.Other perspectives (eg. the Indigenous male’s perspective in this play) can be obscured or merely discussed second-hand.The lack of dialogue limits the actor to monologues, soliloquies and movement and dance pieces. What are some of the other challenges the director must overcome when preparing for a performance which uses a single actor? Remember that the purpose of this play can also involve raising the audience’s awareness of past events and enabling them to empathise with Indigenous Australians and recognise our common humanity. Dramatic form or style How does it entertain the audience? How does it assist the playwright to inform the audience? Monologue A dynamic form which draws the focus to the individual actor and enables her to capture the audience’s attention and use storytelling to explore her own perspective. Enables them to empathise with the protagonist and see the connection between individual experiences and political events as reflected through the eyes of the protagonist. Consider the symbolism of the set – what is it referring to? List the words in order from most to least emotional. Which words do you think are most distressing and why? What does the word ‘nothing’ tell us about what the character is feeling? Why is it repeated? Why is it necessary to see rather than hear these words? Consider the image on the accompanying page to this scene: describe the image and its relationship to the scene. The first three scenes are similar in that they are preparation for the story that follows. Why is this preparation necessary and describe the way the three scenes work together. What mood do the three scenes try to create in the audience? What is this scene saying about Aboriginal identity and family? Are the memories specifically indigenous? Describe each of the photographs in ‘Photograph story’: What do they tell us about the character’s family? What do we learn about the time they lived in? What was valued? Choose four of your own photographs which represent ‘your story’ and explain why they are most significant to you. What is the significance of the suitcase? What might the father have fought against? Consider Indigenous history from 1967. What would he have gone through that the daughter doesn’t have to go through? In ‘Story of a father’, have different members of the class research one of the public figures mentioned. What was their stated attitude towards Indigenous people? Why has the playwright referenced them? Consider ‘Nana’s story’ with ‘Front and centre’. What do we learn about funerals? Why are funerals important in the grieving process? This is a very effective scene which conveys a lot about oppression. Explain how the scene shows this. The stage directions state that a clock ticks in this scene – why? Who are ‘They’ in the first line and what are they doing? How does the speaker treat them? The first lines of the second stanza start ‘without warning’. Why are the actions that follow so shocking? What different historical events might each stanza refer to? Note how each stanza uses parts of the body. Find the references and explain them and the actions they refer to. Note when the references are aggressive or passive and who they concern. The final stanza is expressed as parallel infinitives but also uses the homonyms ‘wonder’ and ‘wander’. Note the line in the stanza before: ‘watching unsympathetic wanderings.’ What do you think is the meaning of this play on language? ‘1788’ is anachronistic in nature, with modern colloquial language used to explore an historical situation. While this is a serious matter there is also humour: explain how the humour works. Consider the idea that the First Fleet members were uninvited guests. Write a monologue where a guest turns up to a sacred or special place and disrupts the lives of those who live there. You must write from the perspective of the guest, who now regrets and understands his actions. Humour is often a way of conveying very serious issues. Read about humour and identify which features this scene demonstrates. Why is this an important poem? Related text: Students should research Bobbi Sykes. What movements was she involved with? What has inspired her poetry? What was her background and upbringing like? They should read ‘Miscengenation’ a poem which deals with a girl’s search for her biological father. How is Aunty Grace different from the rest of the family? Why is she seen as ‘not really family’? What common experiences, goals, ideas or interests bring families closer together? Why has Grace’s move away been viewed as a betrayal by her family, and is their judgement fair? Note: The suitcase recurs throughout the play as an important symbol, linking the past with the present. What is the purpose of including a ‘court report’ style scene? How does this add to the message of the play? Why do you think this particular incident is reported? Why is it important that the protagonist breaks away from the written word and improvises? What does it say about the gap between unemotional ‘media reports’ and the harrowing truths surrounding Vocke’s death? Trace the words ‘fighting’ and ‘grieving’ through the scene. What is the relationship between these words in the way they are used in the scene? What is the purpose of the march? What is the impact of the march? After reading ‘March’, think of three headings that could be used for news reports covering the march. One of these headings will be sympathetic towards the protesters, another will be factual, and the last will be hostile. Share your ideas as a class and discuss which ones are the most interesting. Draw a sketch of the actions mentioned in ‘Bargaining’. What do you think the message of this scene is? What has happened to disrupt the tribal customs of the Indigenous people? Why don’t they know who their ‘mob’ is? What is the symbolism of the red earth? How does the brother feel about what he has done? Is the criminal justice system fair in the punishment it gives him? Why is his imprisonment a racial issue? Write an account of a day in the life of the protagonist’s brother from ‘Story of a brother’. Your account should be written by a social worker who visits the brother in prison. Why is this an important scene in the play? How does it help us to understand the rest of the play? If you were the director, would you have the actor on stage during the display of the images? Why or why not? Trace all the references to the suitcase through the play and list these. Then look at the references to the suitcase in Scenes 22 and 23. Write a paragraph about the significance of the suitcase. Notice how most of the lines start with the indefinite article ‘A’ with My nation in the middle and What a mess as the last line. How would the meaning change if you replaced “a” with “the”? Who is referred to before the middle line My nation knows my identity and who is referred to after that line? What do these few lines say about the impact of the First Fleet? d) an image of the Australian ‘nation’ as seen by an Indigenous Australian. Compare your cartoon with those of other students. What do they tell you about your understanding of the play? What is the woman saying about words? Do you agree? Why does the word ‘reconciliation’ come out of the suitcase? Write a paragraph in response to the phrase ‘everything has its time’. Compare the ‘time’ when this play was first performed (the early 1990s) with the issues that Indigenous Australians experience today. What still needs to be changed? What progress has been made? In pairs, prepare a reading of ‘Plea’. Each member of the pair will read out roughly half of the lines. Although originally written as a monologue, your task is to read this scene out as if your two characters are speaking to each other and echoing each other’s thoughts. Allocate particular lines to each member of the pair. Record your reading if possible or perform some examples to the class. ‘Grieving’, ‘grief’, ‘grieve’ all appear in this poem. What is the woman saying about grief? What is the effect of moving between the personal pronouns: I, we, our, my? Land, family cultures are grammatically presented as equals (grieving for our land, our families, our cultures). What relationship is the woman declaring by placing these words together? What is her answer to ‘What can I do?’ ? How does this play help to answer the question? After reading ‘Walking across bridges’, consider why the play (first performed in 1995) ends with the Bridge walk. Research the walk and why it was significant. Do some research and rank your events from most to least important. Write two to three sentences explaining the significance of each event and what happened. As a class, choose your two most significant events. Explain why they are significant. While this play is based on one actor, she plays many different characters. What might be a common characteristic of all the women represented in the play? By depicting so many different women with one woman, the play shows the experiences of an Indigenous ‘everywoman’. Consider your own culture, or that of ‘White Australia’. What would the life of an ‘everywoman’ in this culture look like? Write her biography in a paragraph. Then explain the differences between your character and the protagonist of the play. Wesley Enoch was originally inspired to write the play in 1993 due to his grief after the death of his grandmother. At the nucleus of the play is an attempt to link the 7 Phases of Aboriginal history to Elisabeth Kubler-Ross’s model of the 5 Stages of Loss and Grief, said to be a universal response to death and dying. The idea is thus to emphasise the parallels between the history of invasion, dispossession and genocide (which essentially led to the death or change of many aspects and traditions of an ancient culture) to the individual experience of grief. In doing so, the play recognises the loss and sadness experienced by generations of Indigenous Australians and suggests that they have undergone a ‘death’ of sorts. Use the words from the 7 phases of Aboriginal History and the 5 Stages of Dying (see back cover of the play) to fill in the spaces of this cloze activity (PDF, 206KB). Scene 10: (‘Invasion poem’) uses poetry to explore a woman’s response to having her children forcibly removed as part of the Stolen Generations. Scene 11: (‘1788’) is a brief and amusingly anachronistic response to the events of 1788, with the Woman responding to the invasion in modern colloquial language. Scene 24: (‘Walking across bridges’) refers to the People’s walk for reconciliation across the Sydney Harbour Bridge in 2000 (also called the ‘Corroboree walk 2000’). This event was a watershed moment for reconciliation at a time when the government refused to give a formal apology for the Stolen Generations. It is estimated that over 250,000 people walked over the bridge on May 28 in support of Indigenous Australians. Enoch’s moving simile portraying the bridge as looking “like a rainbow serpent” that day ends The 7 Stages of Grieving on an optimistic note. An interesting interview relating to Prime Minister John Howard’s refusal to say ‘Sorry’ appeared on the ABC the next day. Scene No. Historical event portrayed in the scene. The protagonist’s attitude and reaction to the event. Significance of this event for Indigenous reconciliation. “The most useful texts are those which link the personal and the political.” To what extent do you agree with this statement in relation to The 7 Stages of Grieving? Discuss why the themes and issues discussed in the text make it a significant work. Write 2-3 sentences explaining the significance of each event and what happened. After completing these introductory activities, you should be aware of many of the key recent events in Indigenous history and be able to move on to the next stage of the task. Imagine that Wesley Enoch has decided to update his script for The 7 Stages of Grieving and has decided to add another scene to the play. This scene will explore his protagonist’s response to a recent historical event which has affected her as an Indigenous woman. The playwright is busy with other projects and has decided to conduct a competition where students studying the play can help him with his latest revision by writing new material to add to the play. You have decided to enter Enoch’s competition. Your task is to write a monologue as the protagonist of The 7 Stages of Grieving when she witnesses one of the events your class has selected as being significant. Your scene will act as an epilogue to the original script of The 7 Stages of Grieving. You must include a 350-400 word “Playwright’s discussion” with your script to justify how the script relates to the original concerns/themes of the play and is consistent with Enoch’s purpose and intentions in writing the play. In your writing, you will explain why you made particular decisions when writing your monologue. For example, what event did you choose to portray and why? What decisions did you make about the staging? How is your understanding of the protagonist reflected in the monologue? Use a similar tone and style to the scenes in the play. Include stage directions in your scene. Ensure your scene is at least 2.5 minutes long (but no longer than four minutes). You may choose to use song, poetry or reportage as part of your scene, but this is optional. You can use mime, dance or music in your scene, but for no longer than 30 seconds of the performance. your discussion of your purpose in writing the scene. Submit your scene and discussion to your teacher for assessment. Which was the most common event chosen by the students to use as the basis for their performance? Why do you think so many students chose this event? What were some interesting performance styles used? Was any particular performance especially dramatic or powerful, and why? What aspects of the protagonist seemed to be most important to the students in their performances? What characteristics or aspects of her personality were shown to the audience? What do you think the purpose of the original play is? Has your understanding changed since seeing the scenes written by other students? A potential question for a class debate by the students after watching the performances is: Do you think The 7 Stages of Grieving needs to have additional scenes added to make it more relevant to us now? Has our understanding of the need for Indigenous reconciliation changed significantly since the play was first performed in 1995, and if so, how? You work as a website designer for the Indigenous Australians Social Justice Alliance (a fictional organisation). You have met the protagonist in The 7 Stages of Grieving and have heard about many of her experiences through your work with the Alliance. ‘Are you grieving? Coming together to share our stories‘. The website will aim to deliver information to anyone who has been affected by our past treatment of Indigenous people, and anyone who would like to find out more about the effects of racial discrimination against Aboriginal Australians. The protagonist of The 7 Stages of Grieving and her family have been invited to share their stories on this website. A section on ‘My 7 phases of Aboriginal history’, written by ‘An Aboriginal Woman’ (the protagonist of The 7 Stages of Grieving). In this section, she will link the phases of Aboriginal history to her own experiences as articulated in the play. A section on ‘Aunty Grace’s story’ (Scene 13), where Aunty Grace tells her side of the story and why she chose to emigrate. She may have had personal experiences of racial discrimination which are not discussed in the play. Consider the ‘typical’ experience of an Aboriginal woman living in Australia over fifty years ago and how it has affected her. A section on ‘Find Out More’. This section will relate to the historical events which are discussed in the play (refer particularly to Scenes 14, 15 and 24) and their importance in terms of Aboriginal Reconciliation. You may wish to submit your work via Edmodo, wikispaces or by using Typepad or a similar free program which allows you to create a simple website. Whilst the emphasis is on the quality of the written submission (and it is possible to submit the work by simply printing off each section for assessment and creating a home page on a Microsoft program or similar), this may be a good chance for teachers to integrate ICT into their teaching practice by engaging with the processes involved in creating a website. Please note that AustLit is a rich resource for any study of Australian literature or of Australian writers. To access this online resource, you need to do so via your school/college library or through your own personal membership of your state or territory library service. Talk to your school or local librarian for more information. KATE MURPHY (O’Connor) teaches English at an independent girls’ school in Sydney. She has an MA in English Literature, was a University Medallist in Education and has co-authored HSC English study guides. Kate has been active in the NSW ETA and has published academic articles internationally.